Eighteen years ago when we moved from our Maine homestead to Canada where we established a new homestead in the wilderness of northern Saskatchewan, we knew gardening was going to be a challenge. I was especially concerned about growing perennial fruit plants such as raspberry and berry bushes that would need to survive winter temperatures of -40 or even colder. 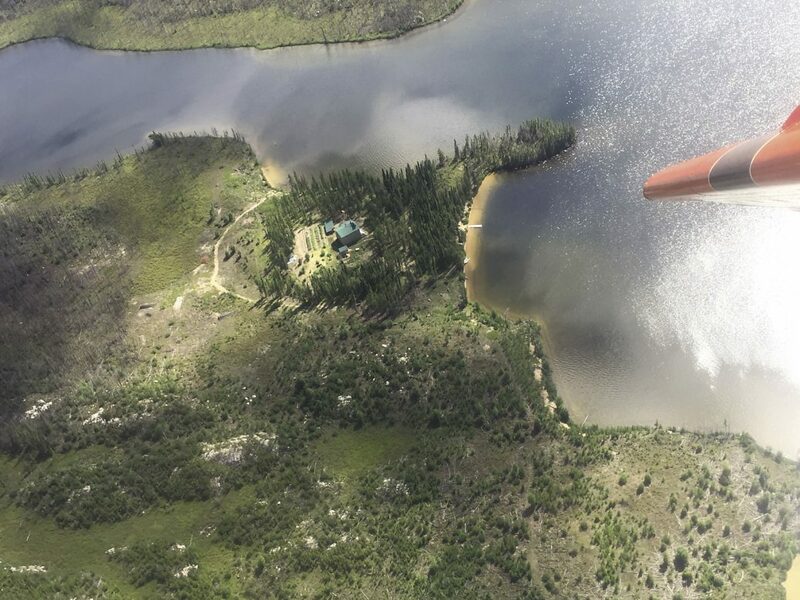 Located just above the 56th parallel, our growing season is short, snow is on the ground well into May, our summers are often cool and the threat of frost is ever-present. We’ve even had hard freezes show up by the third week of August. So given these obstacles, what fruits are we able to grow here? Quite an amazing variety actually, and in a quantity such that I’m able to raise and preserve about half of our yearly fruit needs. To someone in milder latitudes this might not sound like much of an accomplishment, but given our conditions, it’s a remarkable feat. We successfully raise strawberries, saskatoons, red and black currants, raspberries, gooseberries, sand cherries, and cherry plums. Although not a fruit, because I use it as though it were a fruit, I’ll include rhubarb in my list. All these plants originally came from nurseries and were transplanted here. I’m also able to raise some cantaloupes, although special techniques are required to be successful. In addition to the aforementioned cultivated fruits, we are blessed with two fruits that grow wild, blueberries and cranberries. Each grows in such abundance we can’t possibly use them all. 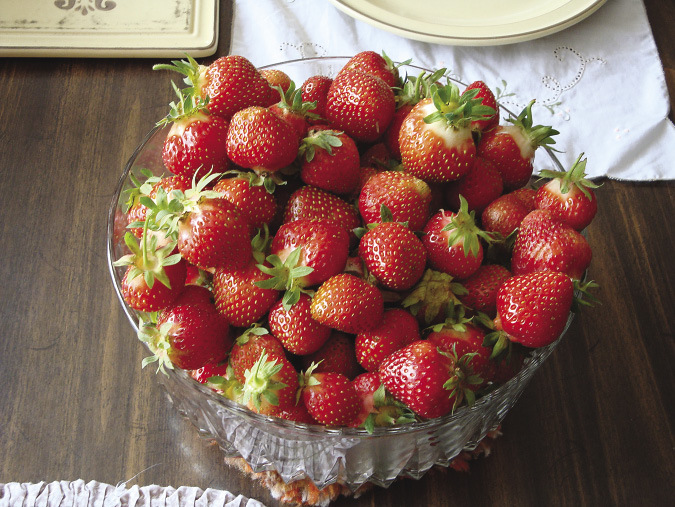 As far as the cultivated fruits are concerned, strawberries are by far the most prolific. One year we harvested 130 quarts! To facilitate our success with these berries, we spread a sheet of N-sulate over the strawberry bed once the snow melts. This creates a greenhouse effect thereby warming the plants and soil, keeping heat in at night and protecting against frost, all of which contribute to an earlier, more abundant harvest beginning in mid-July. We love strawberries and eagerly await the first ripe fruit each summer. While they’re available, we’ll eat them every day, usually three times a day. I make jam and I freeze cartons of sweetened berries for winter use. These form the backbone of our homegrown fruit compotes. Once I’ve frozen all the freezer will hold, if the berry patch continues to produce, I make leather and strawberry juice. I wait until the end of the strawberry season to make these last two items as they are a great way to use the small berries that come at the end of the season. The large, prime berries that come first are much too valuable to purée for leather or transform into juice. I suspect strawberry juice is something few people have ever heard of. I had never considered making it until I was inundated with berries and desperate for a way to utilize them. To make strawberry juice, wash the berries, hull them, cut or chop if necessary and measure. To each quart of prepared fruit, add 1 cup water. Cook until soft. Watch carefully; this boils over in the blink of an eye. I mash the cooking fruit with a potato masher to facilitate extraction of as much flavor as possible. Strain through a large bag. I use a muslin, pillowcase-sized bag I made specifically for straining juices. I squeeze the bag for greater yield. Next measure the juice. To each 4 quarts of strained juice, add 4 Tbsp. lemon juice and sugar to taste. Reheat juice to 200° F. Pour simmering juice into hot, scalded jars leaving ½ inch headroom. Process in hot water bath (190° F) for 10 minutes for either pints or quarts. (from Putting Food By 4th edition). I figure 8-9 quarts of prepared fruit yields six quarts of juice. The mid-July strawberry festival marks the beginning of a busy and often frantic two month period when the assortment of fruits at our disposal mature. Harvesting and preserving them are time consuming, labor intensive tasks. Saskatoons are a marble-sized, blue colored fruit that are good eaten fresh, made into jam, or frozen. Strawberries are the most prolific of our cultivated fruits. One year we harvested 130 quarts! Close on the heels of the strawberries, saskatoons start ripening, followed by red and black currants, then raspberries, gooseberries, and finally sand cherries and cherry plums. Without fail the next fruit starts ripening before the previous one is done for the year so we have to deal with more than one type of fruit at a time. And that doesn’t include the wild berries we have access to. Wild blueberries start ripening by early August and continue into September. Wild cranberries are usually ready by the end of August. 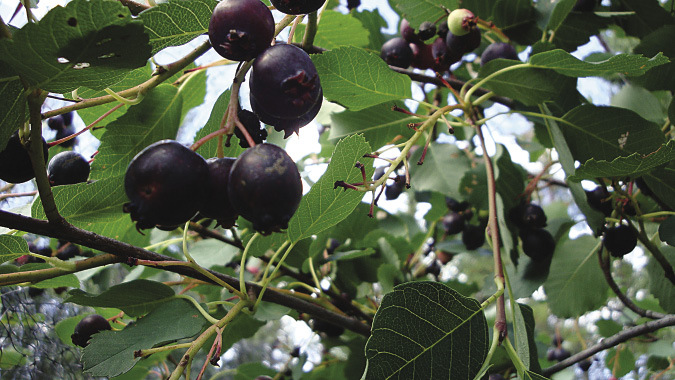 Saskatoons, also known as Juneberries or Serviceberries, are native to the prairie provinces. But they also thrive in our more extreme location. In early spring, while the plants are still dormant, we prune out old, damaged or less vigorous stems. Provided we have warm weather when the 6-8 foot tall bushes are blooming so the bees are out pollinating and we use netting to protect the berries against bird predation, we can be assured of a good crop. Powdery mildew can be a problem, but I’ve found it can be controlled with a spray program of sulphur. Saskatoons are a marble-sized, blue colored fruit that are good eaten fresh, made into jam, or frozen. In winter I add some frozen ones to our other frozen berries to form our homegrown berry melange that we have just about every winter day for breakfast. Additionally, they can be used much like blueberries in muffins, pies, and crisps. Currants are often overlooked by backyard gardeners. Their cultivation may even be forbidden in some states due to the threat of white pine blister rust. Fortunately for us no such restrictions apply. Both red and black currants are extremely hardy, much more so than any nursery catalog indicates. Ours have survived actual temperatures of -57° F. In fact, the black currant is so tough it always starts leafing out before the snow is completely gone. Both red and black currants are extremely hardy, much more so than any nursery catalog indicates. Ours have survived actual temperatures of -57° F.
Fruits of black currants are the size of large marbles. As they ripen, they go through color changes turning from green to purple to black, the color indicating they are fully ripe. They can be used to make a good jelly, but I prefer to make juice out of them. To make currant juice, I follow the same procedure that I use for strawberry juice. 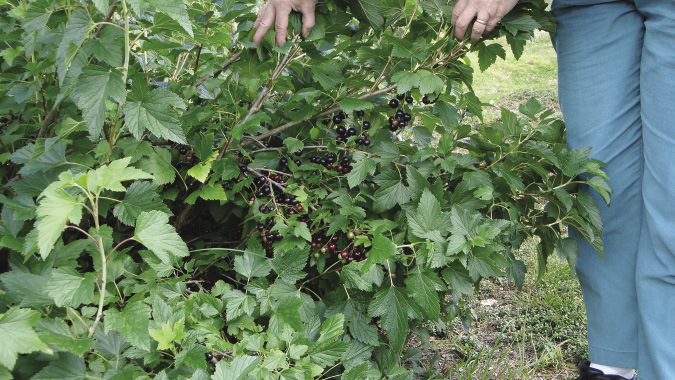 One black currant bush yields enough berries to make quarts and quarts of juice. One year I put up 28 quarts of juice from my one bush. Not bad considering the bush is only about hip height. But if one black currant isn’t enough, you can easily propagate more by mound layering. To do this, select a branch close to the ground, gently scrape off some of the outer bark, apply some rooting hormone powder, bend the branch down until it touches the soil, pile more soil on top of it and weigh everything down with a rock. Eventually roots form where you scraped off the bark. Clip off the branch and plant in a new location. This will grow into a new bush. While smaller in size, about that of a pea, red currants also make a great juice as well as a fantastic jelly. Because both red and black currants are naturally high in pectin, the addition of commercial pectin is not necessary in order for them to gel. In my experience, red currants seem to be prone to powdery mildew and if I’m not diligent with my spray program of sulphur, I lose out on the fruit. Interestingly, the black currants have never been bothered with powdery mildew. As with saskatoons, early spring is the time to prune currants. Cut out any branches that are damaged, not vigorous, or more than three years old. The literature says to have 3 one year old canes, 3 two year old canes and 3 three year old canes, but we generally have a few more than that in each age category, probably more like five to six canes in each age class. If we’re able to keep the snowshoe hares from gnawing on our raspberry canes during the winter (we use a fence of chicken wire), we get enough to enjoy fresh as well as some to freeze. They make a nice addition to our winter fruit mixes. I’ve had good success with Boyne red raspberries and Honeygold yellow raspberries which really live up to their name as they’re deliciously sweet. We have two gooseberry bushes that usually give enough fruit for a few jars of jam. Once again the fruit is roughly the size of a marble and contains enough natural pectin to gel on its own. When ripe the green berries turn dark purple. As with currants, they are easily propagated. In fact, in my experience they are even easier since if a branch merely touches the ground, it will likely root. Despite being armed with ½-inch thorns, hares will also gnaw on these branches if not protected by a fence of chicken wire. Being a vector for white pine blister rust, cultivation of gooseberries may be prohibited in some areas just as currants are. 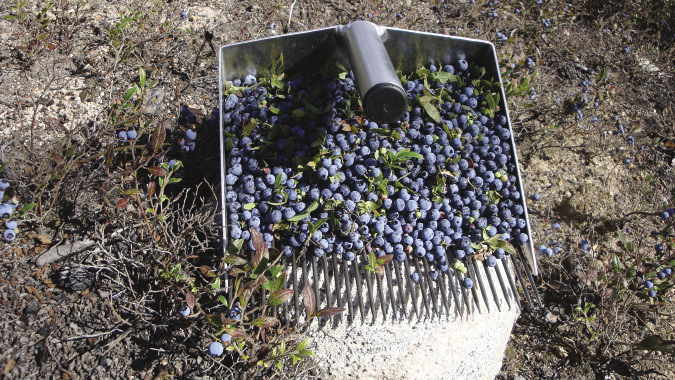 The rake has long tines that reach in and snag countless blueberries with each swipe. In a good year we are able to get both sand cherries and cherry plums. By good year I mean firstly warm weather during blooming for bee pollination and secondly being able to get in to September before the onset of cold weather so the fruit can fully mature and ripen. I would have to say that is the biggest challenge with these fruits, as even in a good year some fruit doesn’t completely mature. I can these fruits for winter eating using a medium syrup as the packing liquid. They make a nice alternative to the frozen berry blends. Rhubarb is a hardy perennial that like the black currant thrives here. It is one of the first plants to revive in the spring assuring us the long winter is finally over. Only the stalks are used, never the leaves. To harvest, I twist or cut off the stalk at ground level, trim off the huge leaves and discard. I never harvest all the stalks. I leave at least ⅓ of them to feed the plant, otherwise I risk killing it. If a seed head forms at the top of any stalk, I trim it off. I want any energy going to the plant itself not to seed production. I’ll use rhubarb in baked goods such as muffins, in desserts such as crisps, and I’ll cook it with some water and sugar until soft. Once chilled this is good mixed with homemade yogurt. Rhubarb is very easy to freeze. Simply wash, chop and throw in a ziploc bag. Frozen rhubarb works great in all the items I make, much the same as when it’s fresh. Once in a while I make some jam, but my preference is to use any surplus rhubarb to make juice. To make rhubarb juice, wash it and cut into ½ inch pieces. Add water to cover. Simmer until soft, strain through a large bag. Add ¼ cup sugar to each 4 cups of juice. Heat to 200° F. Pour simmering juice into hot, scalded jars leaving ½ inch headroom. Process in boiling water bath (212° F) 10 minutes for either pints or quarts. To use, open a quart jar and add 1 tsp. orange extract and 1 tsp. lemon extract. Mix. Combine this with equal parts of ginger ale, preferably homemade, and juice. Enjoy! Chilled, this is a great thirst quencher on a hot summer day. 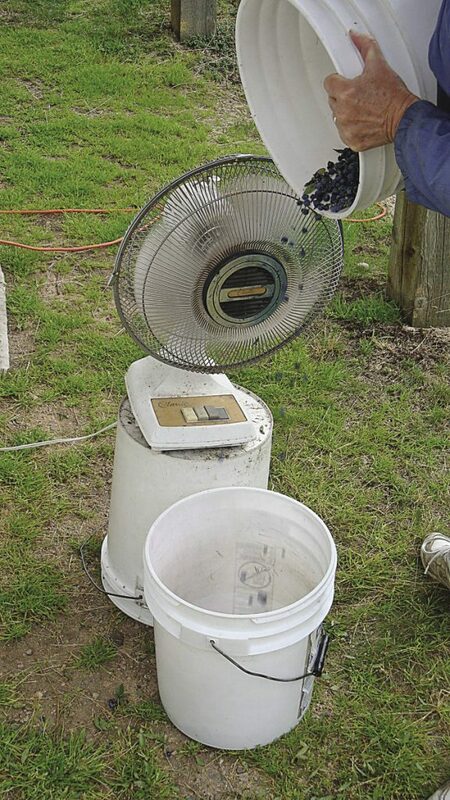 I winnow the blueberries using a fan by pouring the fruit from one bucket to another letting the fan blow away leaves and other lightweight debris. Thanks to our greenhouse, I’m able to grow some cantaloupes each summer. I’ve had good luck with Fastbreak, a hybrid variety, but this year I tried Minnesota Midget, an heirloom variety. It outpaced Fastbreak for fruit production so I’m leaning toward switching to Minnesota Midget. An added bonus is that I can save my own seeds since it’s open pollinated. Wild cranberries are literally at our doorstep as the house is surrounded on the north and west sides by a thick carpet of plants. To be assured of a melon harvest, I start seeds indoors in April by presprouting them between layers of damp paper towels. Once sprouted, I plant them in containers filled with my sterilized soil mix. Care is required when I transplant the 4-6 week old seedlings into the greenhouse as they don’t take well to their roots being disturbed. Granted this is a lot of work, but the melons we get are worth the effort. Regarding fruit trees, trying to grow anything other than apples in our location is out of the question due to our extreme climate. Most of the trees we planted 17 years ago are still alive, but unfortunately due to winterkill of branches and attacks by mice and hares, the variety that was grafted onto the root stock is long gone and the growth above ground is purely from the root stock. As a result, the apples are the size of large marbles. Disappointing, but they make a fabulous jelly. With the exclusion of our cultivated strawberries, by far our most prized and plentiful fruits growing wild are blueberries and cranberries. We’re surrounded by acres and acres of blueberries, more than we can possibly use, although we certainly make the most of this abundant resource. Each year we pick gallons and gallons of them. The wild plants are short, only about 12-14 inches high. Due to the berries small size, about that of a pea, picking them by hand would be a mind numbing affair. So instead, my husband, Ron, uses a blueberry rake, a tool specifically useful for harvesting wild blueberries (see photo). The rake has long tines that reach in and snag countless berries with each swipe. The fruit collects in the box-like part of the rake. Once the box is full, Ron empties the contents into a bucket and repeats the process. He’s become a pro at raking blueberries and can pick roughly a 5-gallon pail of berries in an hour. 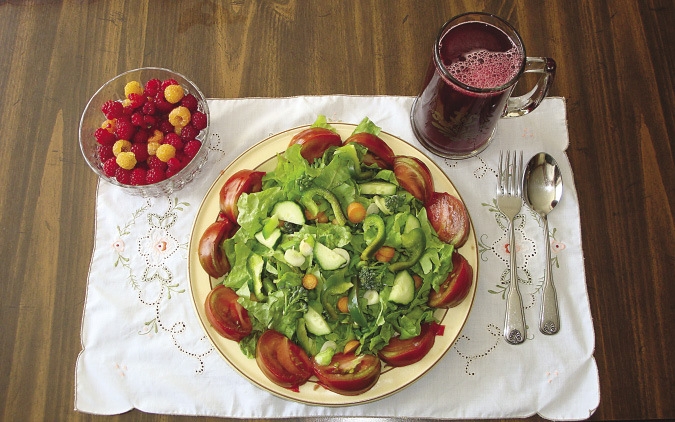 A homegrown meal of vegetables, black currant juice, and raspberries is both colorful and delicious. That’s the easy part. Next comes cleaning and sorting the harvest. First I winnow the berries using a fan by pouring the fruit from one bucket to another letting the fan blow away leaves and other lightweight debris. Next Ron puts the berries through a ¼-inch screen. Small, immature green berries pass through the screen and are discarded. The prime berries that remain on top of the screen are ready for the final sorting process. The two of us team up and spend a couple of tedious hours picking through the semi-clean blueberries to remove any remaining detritus or inferior fruit. By the time we’re done, gallons of prime berries are ready for eating, freezing, or processing. We will have several raking and cleaning sessions each summer, so by the time we’re done, we’ve easily dealt with 20 gallons of blueberries. How do I make use of such a bountiful harvest? During blueberry season, we each eat a bowl of them for breakfast every day. I make jam and I freeze at least three bulging ziploc bags for winter use. Arranging the cleaned and washed berries on trays, freezing them, then bagging up the frozen fruit makes it easy to measure out just the right amount during the winter months. There’s nothing like homemade blueberry muffins or pancakes on a cold winter morning. They also make a great addition to our frozen berry blends. And finally, I make blueberry juice. I make gallons of it each summer. Some we drink fresh and some I can. By using the method I outlined for strawberry juice, I like to have at least 14 quarts of blueberry juice canned for the winter. Wild cranberries are literally at our doorstep as the house is surrounded on the north and west sides by a thick carpet of plants. 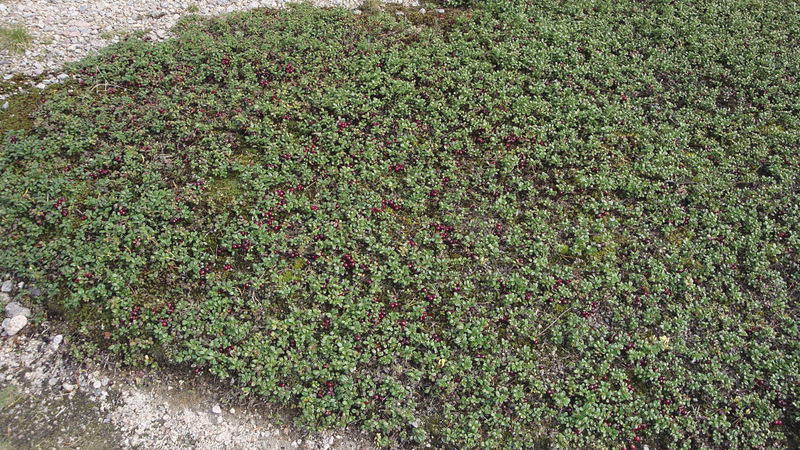 Unlike the wild blueberries, the wild cranberries are ground hugging plants. They produce berries that are about half the size of their commercial counterparts. I used to pick these by hand one berry at a time, but Ron discovered he could use the blueberry rake to harvest the cranberries too. He can rake a bucket in a fraction of the time it would take me to pick the same quantity manually. We go through the same cleaning process that we use for the blueberries. As with the blueberries, I freeze at least three bulging bags of cranberries. Because we love cranberry sauce, that’s the way I use most of the frozen berries. But they make great additions to breads and muffins too. Cranberry juice is another favorite. Every fall I make gallons for fresh drinking and I have canned up to 28 quarts for the winter. Mixing equal parts of blueberry and cranberry juice for a winter time cran/blueberry cocktail is a special treat. We love cranberry sauce, but these beauties also make great additions to breads and muffins. 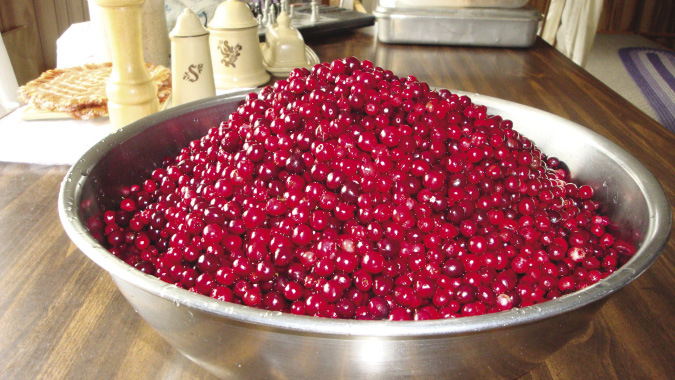 To make and can cranberry juice, measure washed berries and add an equal amount of water. Bring to a boil and cook until berries burst. Strain through a large bag. I squeeze the bag for a greater yield. Add sugar to taste. Bring juice back to boiling. Pour boiling juice into hot jars leaving ½ inch headroom. Process in boiling water bath for 10 minutes for either pints or quarts. Finally, my last use for our wild cranberries is leather. I first make cranberry sauce using a little less water than the recipe calls for, then purée it. I spread the purée ¼ inch thick on parchment lined jelly roll pans and dry in my woodstove oven on low heat with the door slightly ajar. Part way through the drying process, I’ll peel off the pliable semi-dry leather, flip it over and continue drying. To make doubly sure it’s dry before I store it, I’ll put the sheet of leather, free of the parchment paper, on a wire cookie rack and let it air dry on top of my cookstove’s warming oven for a few days. If you have tried to establish an orchard, but have had limited success due to your less than desirable climate, don’t despair. Even if you don’t have access to wild blueberries and cranberries as we do, you can still grow and preserve a remarkable variety of fruits. Most nursery catalogues indicate that the fruit we grow here is hardy to zone 3. But I can say with authority all are much hardier than that. If we can grow them here, gardeners with a challenging growing season can too whether they be in the northern states, at high elevation, or any other location. To anyone who wishes to start a backyard orchard or who already has an established orchard, I would urge you to give some of the lesser known fruits such as saskatoons, currants, and gooseberries a try.